Back in 2013, I was researching details for the first book in the Rodeo Romance series. In the story, the hero sustains an injury at a rodeo. In an attempt to get my facts straight for the story, I reached out to the Justin Sportsmedicine Team®. Their responses to my questions were extremely helpful and I was so impressed with them, I wanted to do a little something in return. So I launched a campaign to donate a portion of my book sales to the Justin Cowboy Crisis Fund. 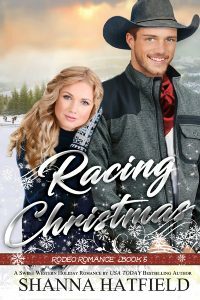 Racing Christmas is the sixth book in the series and continues to promote awareness of the help JCCF brings to injured rodeo athletes with a portion of the book sales donated to the organization through Christmas Eve. The hero, Shaun Price, was briefly introduced in a previous book in the series. He needed a sweet, tough woman to balance his personality and that's when Brylee Barton was created. “Not at all. You go do the girly chat stuff,” he said with assurance then waved at the girls. “Morning, Brylee. How’d you talk the bronzed Adonis into helping you?” one of the girls asked. “After the ad I saw yesterday, it’s a wonder you don’t have guys following your every footstep,” another girl commented, giving Brylee a teasing smile. “No, we just wanted to watch him do that.” The third girl pointed as Shaun broke into a jog and ran alongside Rocket. Between the muscles, tanned arms, long legs, and early morning sunlight glinting off his hatless head, Brylee’s mouth suddenly went dry.